An irreverent cocktail party game for hyperactive socialites. Do some rapid socialising in order to locate likeminded conversationalists but be careful — you wouldn't want to get stuck with a bore! Download the scripts from the link below and print off four each of 1-4 and two each of b1 & b2 onto thick paper or card. 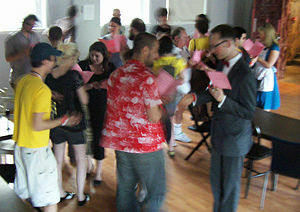 Fold into a booklet, shuffle and distribute to the 20 players who are playing the game. It's advisable to have one game master who keeps time and checks that no-one is cheating or just plain confused ! The majority of you, like G.K.Chesterton, are erudite conversationalists par-excellence. Following the strict conventions of polite discourse, you must hold conversations in order to locate your like minded conversationalists and be the first to form a group of four. But be warned ! Some of you are interminable bores. If so, it will be stamped all over your script. The chances are that any conversation you join will descend from the sublime to the mundane. 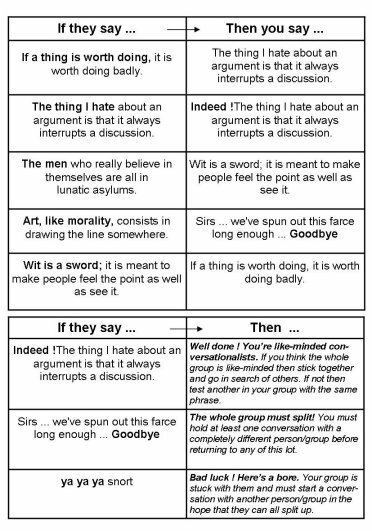 Once a group of conversationalists has you in their midst, the only way they can get rid of you is to start a conversation with another person and hope that the group splits up. You must try to prevent any group of four conversationalists from forming by continually boring others with your idle blather. • Start conversations with any of the opening phrases (see example below). Direct your statements to people by pointing at them with your cigar. • Follow the rules in the table to find out what you say/do next (see example below). Continue to direct your statements at people in the conversation by pointing at them with your cigar. • If no group of 4 manages to form within 10 minutes of game play then the bores are declared the winners. • You may not interrupt ongoing conversations. This would be rude ! • Likewise you may not ignore or leave a conversation once it has been started. • In groups of more than two, make sure that all are engaged in the conversation. • Keep your scripts secret. This page was last modified on 10 April 2009, at 17:53. This page has been accessed 37,042 times.